Occasionally in life, you meet a person whom you truly admire—a hero, if you will. Some of the folks who we offhandedly call heroes today are simply people who possess a certain magnetism, charisma, or talent that gets them noticed. When you ask children who their heroes are, for example, you’re likely to hear a litany of names of sports figures, actors, or musicians—people who make a gazillion dollars for dunking a ball or mooning at the camera or crooning a tune. But those are not the heroes of whom I’m speaking. I’m talking about the “ordinary” hero, the one who rarely gets noticed and isn’t likely to be seen on television. One such hero is a friend of mine. King Montgomery was a hotshot fishing guide on Virginia’s Potomac River when I met him; since then, he has become an award-winning outdoor writer and sought-after seminar speaker. 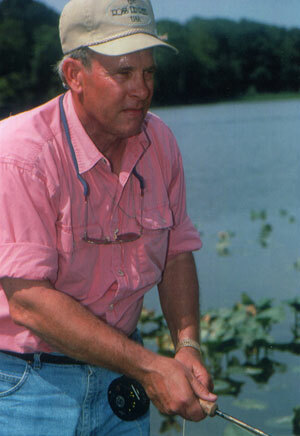 He is a recognized expert on Mid-Atlantic warmwater fly fishing. He has also developed an insatiable desire for pursuing trout with a fly rod. I fish with King whenever I get the chance. Over time, I noticed that he walked a bit slower than usual and winced with pain on occasion. I teased him a little, telling him that he was getting old. He laughed and agreed, saying that an old war injury caused this particular twinge. Now, most of us are kidding when we use that expression—but not King. King Montgomery is a retired army officer who served this country faithfully for 23 years. He was a rifle company commander in Vietnam and saw more combat than he cares to discuss. He caught a round in his leg while engaged in a firefight, and it is this injury that causes my friend to limp periodically. King is a great example of those Americans who put it all on the line for people like you and me every day, day after day. He wouldn’t tell you about the medals he received or about his personal acts of heroism; I found out about them by accident myself. The ironic thing is, of course, that King would deny with his dying breath that he is a hero. Undoubtedly, he would say that he was just doing his duty and that you can find the real heroes resting in places like Arlington National Cemetery. King and his brothers and sisters under arms have served this country all over the world. Some stormed the beaches of Normandy in France; others served as submariners. Some veterans flew airplanes (like King’s father, who fought in World War II and the Korean War); others parachuted out of them. Some were medics who fought desperate daily battles to save lives; others flung themselves on hand grenades or charged machine gun nests to protect their pinned-down comrades. But all answered the call of duty when they heard it. A few of these heroes have been recognized and have even shaken hands with the President of the United States. Most, however, have gone and will continue to go unrecognized. Their reward for valor? Six feet of cold ground and a simple white headstone. A name engraved on a granite wall or a bronze plaque. Many families don’t even know how, when, or where their courageous loved ones died. All that remains of these heroes is the memory of their faithfulness to this country’s ideals and principles. Today, United States armed forces personnel on land, sea, and in the air continue their vigil, in a world as dangerous as it ever was, so that you and I can go about our daily lives in peace. Like King, they would tell you that they are just doing their duty—nothing more. My fervent hope is that as you are out on the stream or in the field enjoying your sport and your peaceful leisure, you will remember these men and women in uniform. The next time that you bump into a member of our armed forces in your neighborhood, I challenge you to thank him or her for keeping us safe. Perhaps you could even offer to buy that serviceman or woman a cup of coffee—or just offer a handshake in appreciation for their faithfulness to duty. If you are now or have been a member of the armed forces, please know that we the American people are forever in your debt. You, and those who went before you into the breach, are the reason that we live in freedom today. If ever we cross paths on the river, remind me that I owe you a cup of coffee and a handshake. I should be easy to spot: I’ll be the fellow eagerly picking up angling pointers from a hero. And my fishing partner King will be easy to spot, too: he’ll be walking with a bit of a limp.